Martin Luther King leading march from Selma to Montgomery to protest lack of voting rights for African Americans. Beside King is John Lewis, Reverend Jesse Douglas, James Forman and Ralph Abernathy. March 1965. Today I want to tell the city of Selma, today I want to tell the state of Alabama, today I want to say to the people of America and the nations of the world: We are not about to turn around. We are on the move now. Yes, we are on the move and no wave of racism can stop us. We are on the move now. The burning of our churches will not deter us. We are on the move now. The bombing of our homes will not dissuade us. We are on the move now. The beating and killing of our clergymen and young people will not divert us. We are on the move now. The arrest and release of known murderers will not discourage us. We are on the move now. Like an idea whose time has come, not even the marching of mighty armies can halt us. We are moving to the land of freedom. I am no longer giving you power by waiting. I am on the move now. And I'm not going alone. Last Thursday evening, my friends Tori and Chloe invited me to speak at a class they lead at Elon University in North Carolina about creatively coping with modern racial tension and oppression in America. 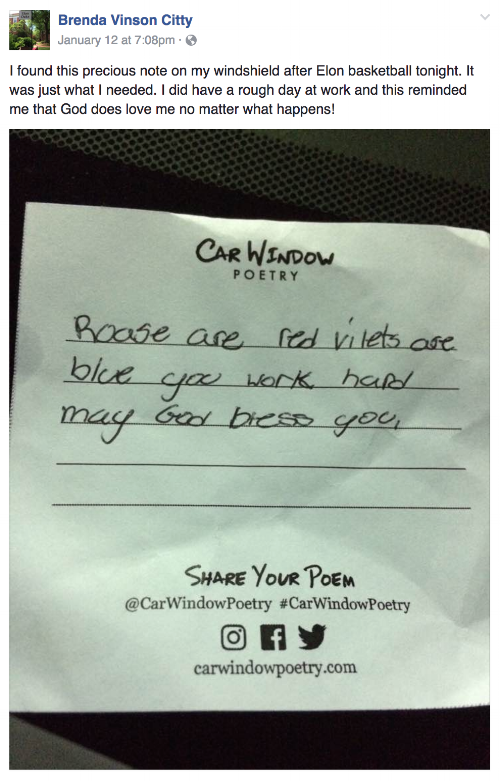 After sharing stories of how race has shaped various experiences in my life, including the formation of Car Window Poetry, we set out – not individually, but together – towards a parking lot full of cars and shared encouraging poems with people we couldn't see but still loved. And you know what, Darkness? People read these words. They were encouraged by these poems. You didn't eradicate light, nor did you eliminate love. Your hate was driven out by our love. You went running for the hills when you caught a glimpse of our light.